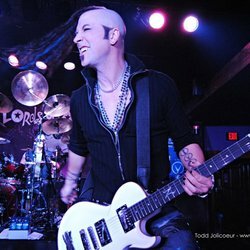 Virus (Andre Virus Karkos) currently plays guitar for an Industrial Metal trio called Device with David Draiman of Disturbed, and Will Hunt of Evanescence. He has also played with country superstars Big & Rich, Nu Metal/Rock band Dope, and Belgian Techno pioneers Lords Of Acid. He also gigs with American Idol star Constantine Maroulis and plays the Guitar 2 chair in the Tony nominated Broadway musical Rock Of Ages in New York City. Whammy DT The WhammyDT has become the "Go To" effect for me. Definitely one of the most innovative pedals to come out in decades.